This is a fairly quick and easy dish to make. It's also quite versatile. It could be packed for lunch or picnic, used as a side when you barbecue or just plainly eaten for dinner. 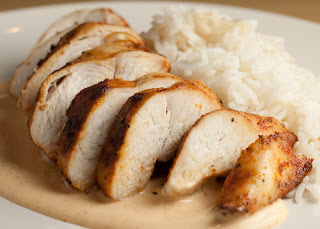 Poaching is probably one of the easiest ways of cooking chicken breasts that I know of. The way I do is it as follows. 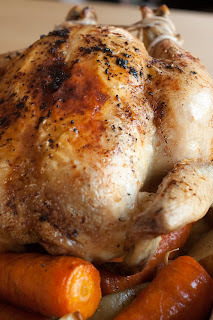 Chuck the chickens into a large pan, add spices and other flavourings of your choice. Pour on enough water (or stock) to cover the chicken well. Bring this to a boil, let it boil for 3 minutes and then remove it from the heat. Cover the pan and let it stand for 30 minutes. Done. After that quick poaching lesson, let's head over to the recipe. Cook the pasta as per the instructions on the packaging, drain and let it cool. Cook the chicken breasts as per above, drain, let it cool and then dice the it. Mix the lemon juice, mixed herbs and olive oil in a small bowl. In a large bowl mix up all the dry ingredients well and then stir in the dressing. These lamb burgers are as good as lamb burgers come but the real star in this recipe is the sauce. 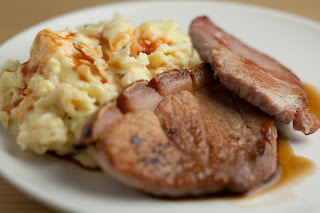 I matched it with lamb burgers this time but it could work with beef burgers, chops or why not as a different condiment for your Sunday roast? It's dead simple to make and you'll be royally rewarded for your efforts. Serving lamb burgers in pita pockets feels more right than serving them in buns for some reason so I go with that. Mix all the ingredients for the lamb burgers in a bowl. Make the mince mixture into six even patties. Fry, grill or barbecue the patties until done to your liking. In the meantime put the feta, basil leaves and olive oil into a food processor and run until you got a nice even texture. 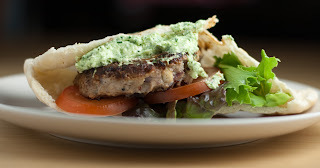 Serve the patties in pita pockets with the greens and the feta and basil sauce. 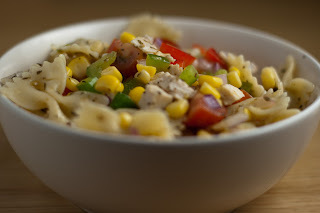 This is a fairly quick and easy recipe for a very tasty pasta dish. Season the steak well and let it be offset by the creamyness of the sauce. You can serve this with a side salad and/or some nice roasted cherry tomatoes. Season the steak strips well. Heat the olive oil in a frying pan and fry the strips until done. Remove and keep warm. Add the white wine to the same pan and bring to a simmer, making sure to deglaze the pan well. Once the wine has reduced to about half of its original volume stir in the cream, mustard and oregano. Let this simmer until nice and thick, this should take about 5 - 10 minutes. In the meantime, boil the pasta per the instructions on the packaging. Drain well, return to the pan and pour on the cream sauce. Mix well. 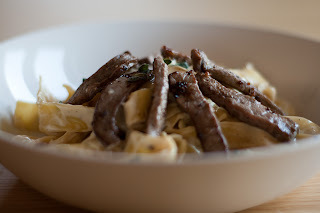 Plate the pasta and add the strips of steak on top. If you're getting bored of cereal, porridege or whatever you are having for breakfast - try this as an alternative on a weekend morning. It will take you a little bit longer to whip up than just pouring milk over some cereal, but it will be worth it. I'm sure you will have seen something like this in one or more of the fast food chains. The added bonus with these is that you don't have to get dressed and get outside to get them. Also, you can have them as late as you want without some pimply faced youth telling you that it's too late in the day for breakfast. I used a frying ring both to the patties as well as to fry the egg in. That way I got a somewhat uniform size to it all. I tried to make the patties a bit thinner so that would make about 8 muffins, if you go for fatter patties you'll probably end up with 4 or so. The egg is optional but adds some extra goodness to it all. The sausagemeat already has a bit of seasoning so it doesn't really need any added salt and pepper either. Drain and finely chop the pineapple. Mix the pineapple and sausagemeat in a bowl. 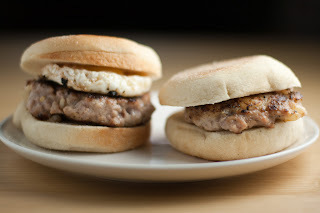 Make patties out of the sausagemeat mix and fry on a medium heat on both sides until done. Remove from the heat as they're done and keep warm. If you are using the eggs, fry them to your liking. Toast the cut sides of the muffins, spread with butter if you want to, and stack on the patties and eggs. Add any condiments you like. This sweetcorn sauce is the result of some thinking and experimenting I did last night. To be honest, it turned out better than what I could have expected. As you can see from the recipe I've listed the addition of chili powder and lime juice as an optional step. However, I think the sauce will be lacking a bit of depth if you leave it out. As for the chicken, I used a barbecue spice mix from Sweden but you can just as well use some home made dry rub or why not a cajun spice mix? This time I served it all with rice but as I'm writing this I just realised that this sauce could be a hit with some meatloaf and mash. Dry the chicken breasts with some kitchen towel then massage in liberal amounts of dry rub into them. Let this sit in the fridge for at least an hour, if you got the time. Heat a nonstick pan, once hot - fry the chicken breasts for about a minute and a half on each side. Move the chicken breasts to some tinfoil on a baking tray. Pop this into the oven until they're cooked - about 20 to 25 minutes normally. In the meantime, bring the sweetcorn and chicken stock to a simmer and let it simmer for about 10 minutes. Pour the sweetcorn mixture into a food processor or liquidizer and process until well pulverised. Put a sieve over a pan and pour the liquidized sweetcorn into the sieve. Use the back of a wooden spoon to force as much liquid through as possible. The more time you take for this and the more thorough you are the better the sauce will get. Once you're happy with the amount of liquid in the pan, remove the sieve and return the pan to the hob on a low heat. Whisk the flour and water together well in a small ramekin or similar. Mix in the cream and flour mix well with the corn liquid. Let this slowly simmer for about 5 minutes or so - until it got a nice and thich consistency that you are happy with. If you feel like it, add the chili and lime juice to taste during this process. 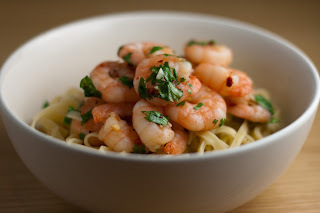 Here's another quick and easy prawn dish, this time with quite a kick. As always, freestyle the proportions of chili flakes etc to suit your own taste and preferences. I served this with egg noodles but you could serve it with rice, in tortillas or just on its own as part of a bigger tapas spread. As always with prawns, be careful not to overcook them or they'll turn far too chewy, almost like bouncy balls. Put the prawns, olive oil, garlic, chili flakes, salt and pepper in a bowl and give it a good stir. Let this marinate in the fridge for at least an hour. Remove from the fridge and let the prawns come to room temperature before you start cooking them. Heat a large frying pan or a wok on a high heat. Once the pan is really hot add the contents from the bowl. Cook, stirring all the time, until the prawns turn pink and are cooked. Stir in the coriander just before removing them from the heat.